Black Eyes, Blue Tears * Don't Be Stupid (You Know I Love You) * From This Moment On * Honey, I'm Home * I Won't Leave You Lonely * If You Want to Touch Her, Ask! * I'm Holdin' On to Love (To Save My Life) * Love Gets Me Every Time * Man! I Feel Like a Woman! * Rock This Country! * That Don't Impress Me Much * Whatever You Do! Don't! * When * You're Sill the One * You've Got a Way. As performed by Shania Twain. Edited by Jeannette Delisa. Songbook: Piano/Vocal/Chords (arranged for piano and voice, with guitar chords). 60 pages. Published by Warner Brothers. (PF9544) Songs include: Any Man of Mine * God Bless the Child * Home Ain't Where His Heart Is (Anymore) * (If You're Not in It for Love) I'm Outta Here! * If It Don't Take Two * Is there Life After Love? * Leaving Is the Only Way Out * No One Needs to Know * Raining on Our Love * Whose Bed Have Your Boots Been Under and more. Diese CD nenne ich mein Eigen. Alle Songs sind reinste Country Musik und weichen daher teilweise erheblich vom Sound der Original Shania Twain Songs ab. Die CD ist hörenswert, es fehl eigentlich nur die tolle Stimme von Shania Twain. Eine unbekannte Sängerin singt auf einem Kanal, auf dem anderen ist das Orchester, mit dem Balanceregler kann die Sängerin abgestllt werden. As performed by Shania Twain. By Shania Twain, Robert John "mutt" Lange. Edited by Jeannette Delisa. Original sheet music. 10 pages. Published by Warner Brothers. (PV98165) This ORIGINAL SHEET MUSIC EDITION has been arranged for piano/vocal/chords by Warner Bros. Publications' talented staff of arrangers. Every effort has been made for the arrangement to be playable on the piano and to sound as close to the original recording as possible. Usually, a separate vocal line is used so that singers can easily sing along, and all lyrics as heard on the original recording are always included. Almost all piano/vocal/chords arrangements are written in the original key in which they were recorded. Special guitar chord frames appear throughout the arrangement so that guitarists can play along. As performed by Shania Twain. Piano/Vocal/Chords. Arranged for piano and voice with guitar chords. 9x12 inches. 8 pages. Published by Hal Leonard. 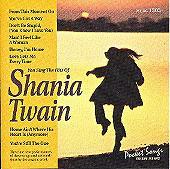 (352025)As performed by Twain, Shania. Easy Piano. Features easy piano arrangements. 9x12 inches. 10 pages. Published by Hal Leonard. (110089). 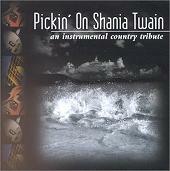 As performed by Twain, Shania. Easy Piano. Features easy piano arrangements. 9x12 inches. 10 pages. Published by Hal Leonard. (110089). As performed by Shania Twain. By Shania Twain, Robert John Lange. Edited by Jeannette Delisa. 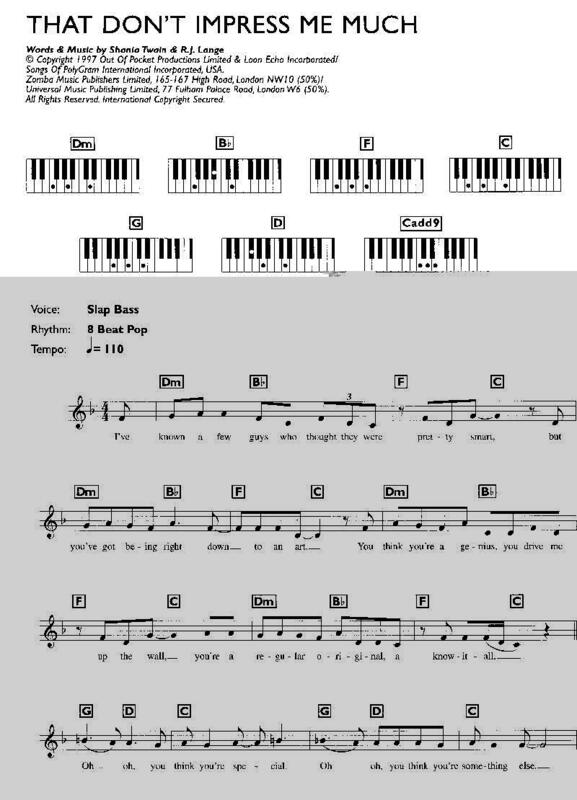 Sheet music: Piano/Vocal/Chords (arranged for piano and voice, with guitar chords). 6 pages. Published by Warner Brothers. As performed by Shania Twain. By Shania Twain, Robert John "mutt" Lange. Edited by Jeannette Delisa. Arranged by Dan Coates. Arrangement sheet music. Level: easy piano. 4 pages. Published by Warner Brothers. (EP9901) An easy piano arrangement by one of the best arrangers in the business, Dan Coates, of the Shania Twain pop/country crossover hit. As performed by Shania Twain. By Shania Twain, Robert John "mutt" Lange. Edited by Jeannette Delisa. Original sheet music. 4 pages. Published by Warner Brothers. (PV9832)As performed by Shania Twain. 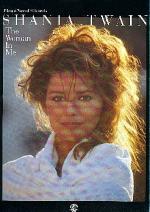 By Shania Twain, Robert John "mutt" Lange. Edited by Jeannette Delisa. Original sheet music. 4 pages. Published by Warner Brothers. (PV9832)This ORIGINAL SHEET MUSIC EDITION has been arranged for piano/vocal/chords by Warner Bros. Publications' talented staff of arrangers. Every effort has been made for the arrangement to be playable on the piano and to sound as close to the original recording as possible. Usually, a separate vocal line is used so that singers can easily sing along, and all lyrics as heard on the original recording are always included. Almost all piano/vocal/chords arrangements are written in the original key in which they were recorded. Special guitar chord frames appear throughout thea rangement so that guitarists can play along. As performed by Shania Twain. Easy Piano. 9x12 inches. 72 pages. Published by Hal Leonard. (306286) More Info: Easy piano arrangements of 12 of her top hits: Any Man of Mine * From This Moment On * Love Gets Me Every Time * No One Needs to Know * Whos Bed Have Your Boots Been Under? * The Woman in Me (Needs the Man in You) * You Win My Love * You're Still the One * and more. As performed by Shania Twain. Piano/Vocal/Chords. Arrangements for piano and voice with guitar chords. 9x12 inches. 88 pages. Published by Hal Leonard. (306285). To see an example of this type of sheet musi notation, click here More Info: Features 14 of this hot new star's best songs: Any Man of Mine * Come on Over * From This Moment On * Home Ain't Where His Heart Is Anymore * Honey, I'm Home * Love Gets Me Every Time * No One Needs to Know * That Don't Impress Me Much * The Woman in Me (Needs the Man in You) * You Win My Love * You're Still the One * more. Love Gets Me Every Time! Don't Be Stupid (You Know I Love You)! Honey, I'm Home! You're Still The One! Come On Over! 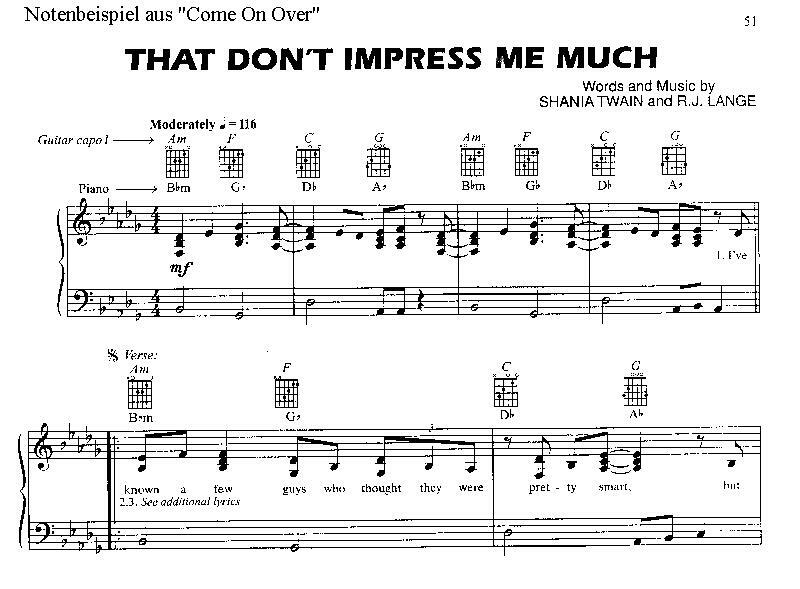 That Don't Impress Me Much! Any Man Of Mine! Home Ain't Where His Heart Is Anymore (If You're Not In It For Love)! I'm Outta Here! No One Needs To Know! The Woman In Me (Needs The Man In You) ! Whose Bed Have Your Boots Been Under? !You Win My Love! From This Moment On! As performed by Shania Twain. Edited by Jeannette Delisa. Original sheet music. 8 pages. Published by Warner Brothers. (PV99126) This ORIGINAL SHEET MUSIC EDITION has been arranged for piano/vocal/chords by Warner Bros. Publications' talented staff of arrangers. Every effort has been made for the arrangement to be playable on the piano and to sound as close to the original recording as possible. Usually, a separate vocal line is used so that singers can easily sing along, and all lyrics as heard on the original recording are always included. Almost all piano/vocal/chords arrangements are written in the original key in which they were recorded. Special guitar chord frames appear throughout the arrangement so that guitarists can play along.